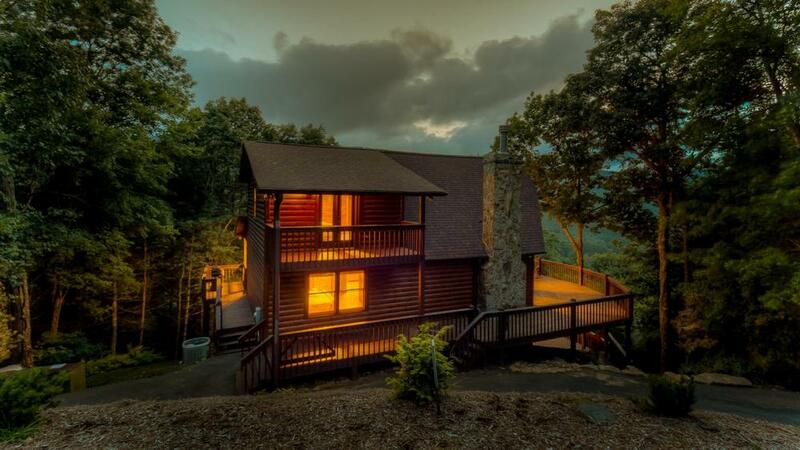 When you think of Blue Horizon, endless vistas and the beauty of nature come to mind, and that's exactly what you'll find in the Blue Ridge mountain cabin rental that bears that name. 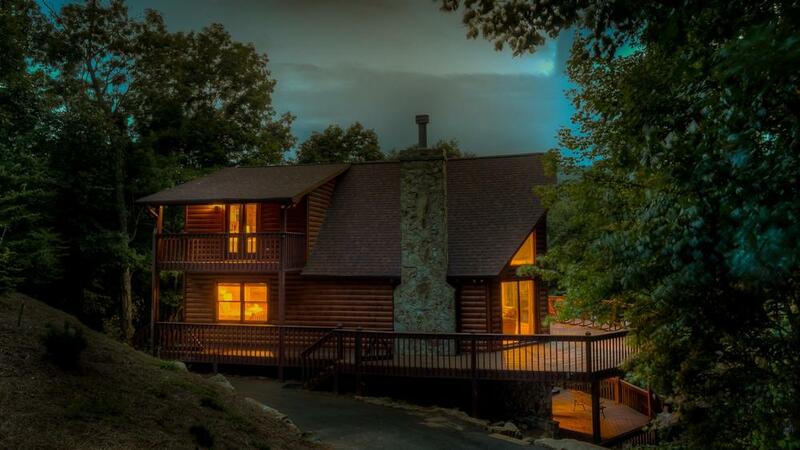 Nestled in the trees with spectacular mountain views, this unique vacation destination beckons you with its magnificent setting, top-drawer amenities, and all the fun and activities the Aska Adventure Area has to offer. With its wraparound deck and enormous windows that provide a breathtaking view from every angle, this special property will make you feel relaxed, reinvigorated and in awe of nature's wonders. 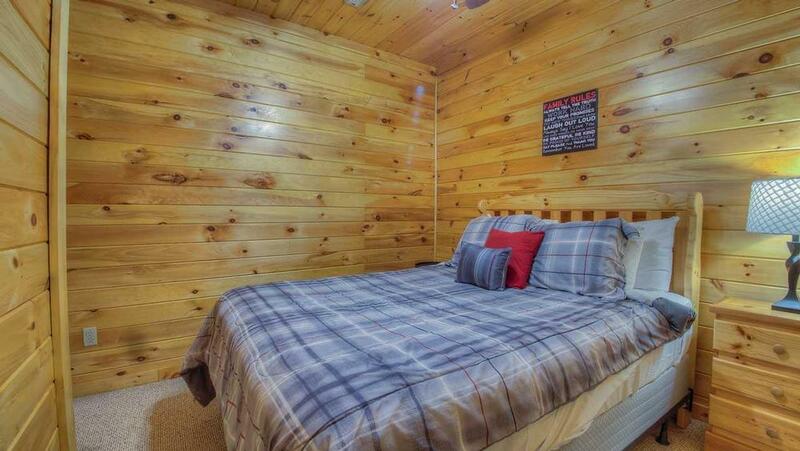 The cabin itself is architecturally distinctive, with vaulted cathedral ceilings and tongue-and-groove pine paneling and flooring throughout, with comfortable country decor and ceiling fans in every room. The super-spacious family room is the perfect place to gather and relax by the fireplace or enjoy a meal you've made in the well-appointed kitchen, with its modern steel and black appliances, granite countertops and pine cabinetry. 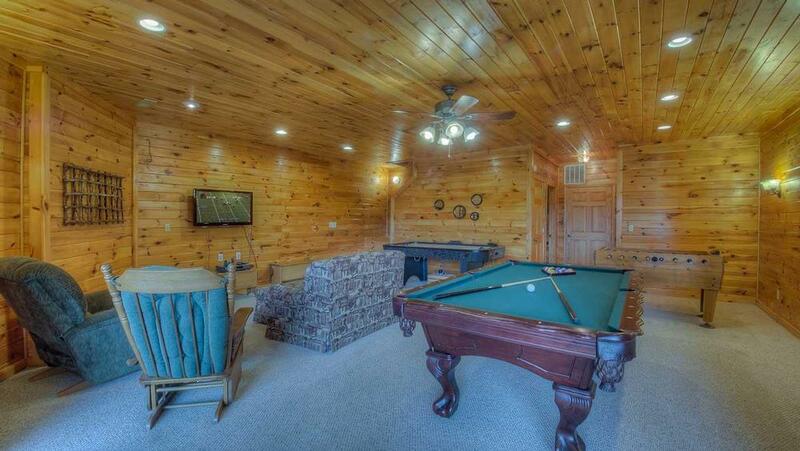 You'll find plenty to do in the game room, with its flat screen TV and DVD, regulation billiards, air hockey, or enjoy the outdoors in the comfort of the screened-in porch. 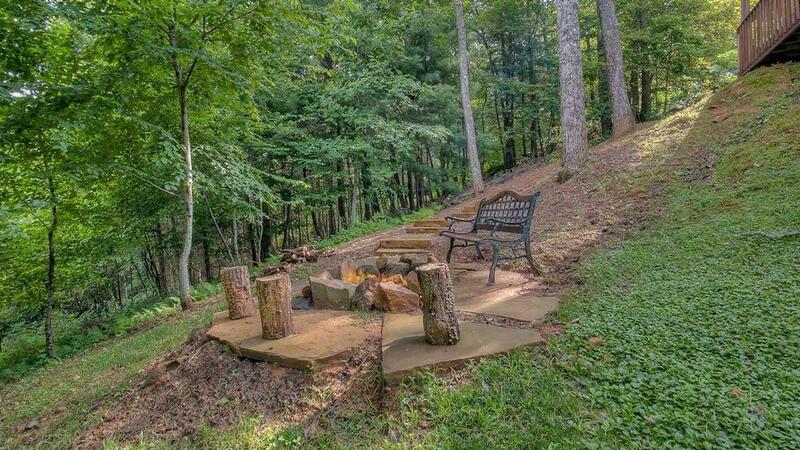 There, you can settle into a rocking chair or the glider to read a book, barbecue some steaks on the gas grill and enjoy them al fresco (the picnic table seats eight), or soak your cares away in the inviting hot tub. 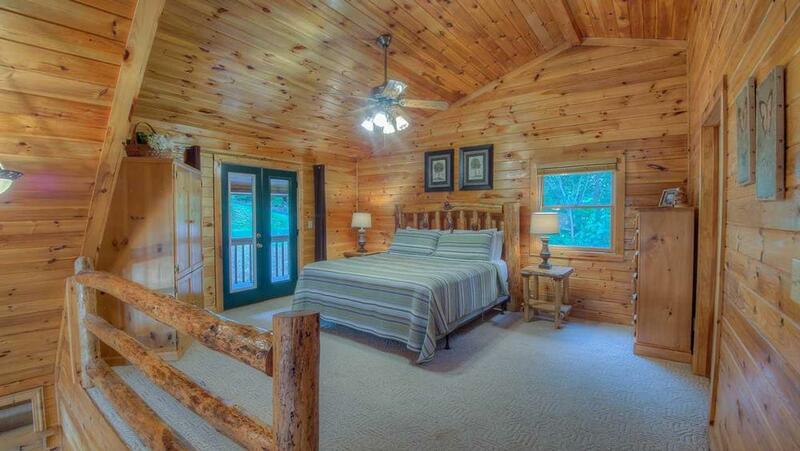 At the end of the day, you'll choose from three cozy bedrooms. The master bedroom suite in the upstairs loft has a king bed with a log headboard, private balcony, large walk-in closet, and private bath with jetted tub and walk-in shower. 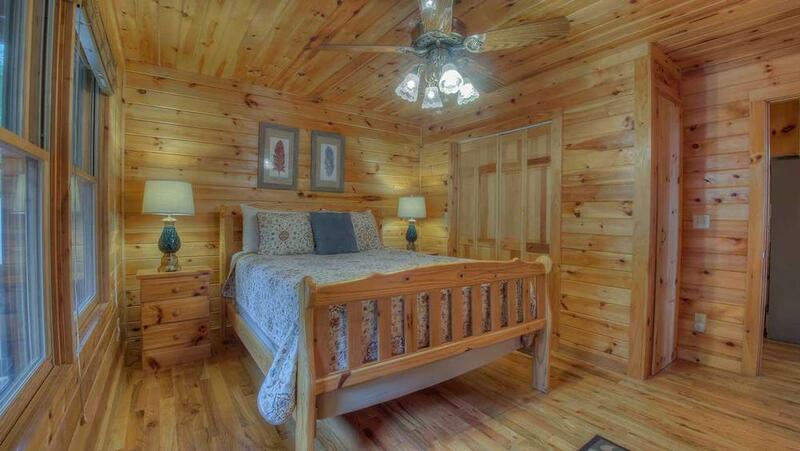 The main level bedroom has a queen bed and bath with a walk-in shower and washer/dryer unit in the closet. 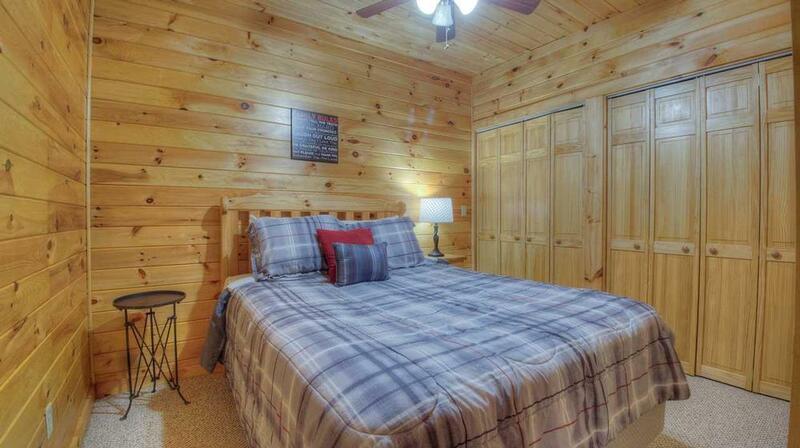 The third bedroom on the downstairs level features a queen bed and plenty of closet space. Feel free to bring your devices as well as your pet pooch, as Blue Horizon is pet-friendly and wifi-equipped, and its paved driveway has ample parking for your guests. But it's the magnificent setting that makes it irresistible. Step onto the deck and watch amazing sunsets as they fall behind the mountain, or in the morning, follow the misty clouds as they meander through the valley below. Listen quietly and you can hear the creek in the valley or a deer in the woods. At Blue Horizon, you'll have a one of a kind experience and special memories you'll cherish for years to come. 03/19 - The cabin was secluded and very warm and inviting. 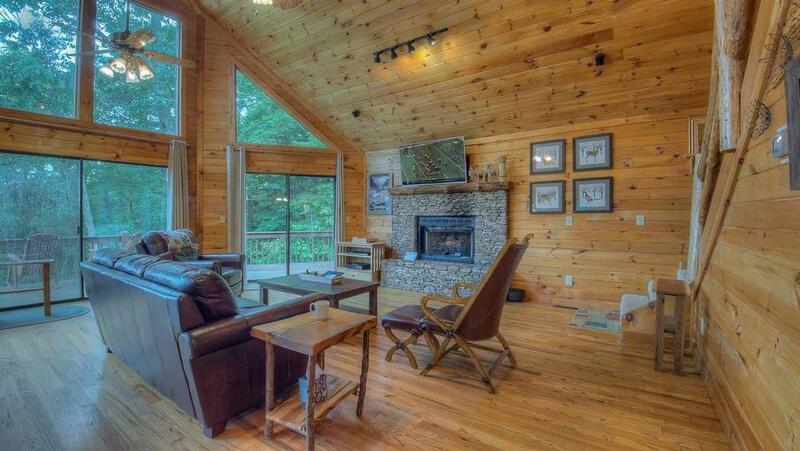 We enjoyed the layout of the cabin and plan on visiting again! 01/19 - Overall it was great! 12/18 - Great cabin. 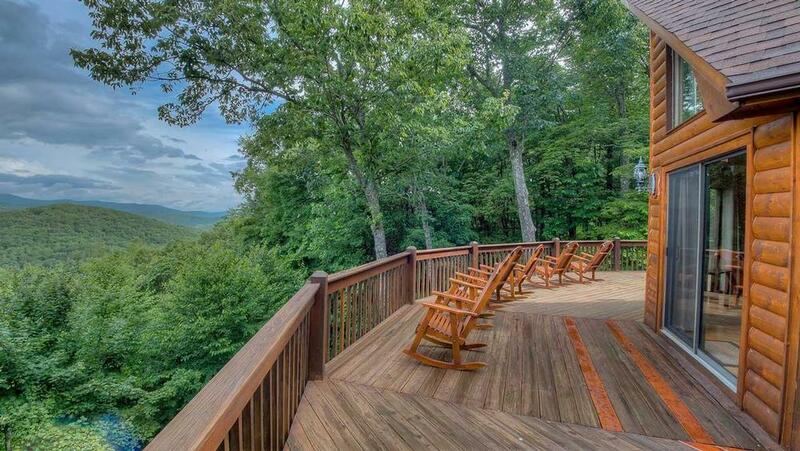 Very secluded, and beautiful views. The house had everything my family of four needed. 12/18 - Best cabin we have rented. Enjoyed the pool table, air hockey, foosball & especially the hot tub. Love when we can also bring the dogs with us! Company seems well run. Have no complaints about the service we received. 11/18 - We enjoyed the cabin so much, being it was our first family cabin trip. 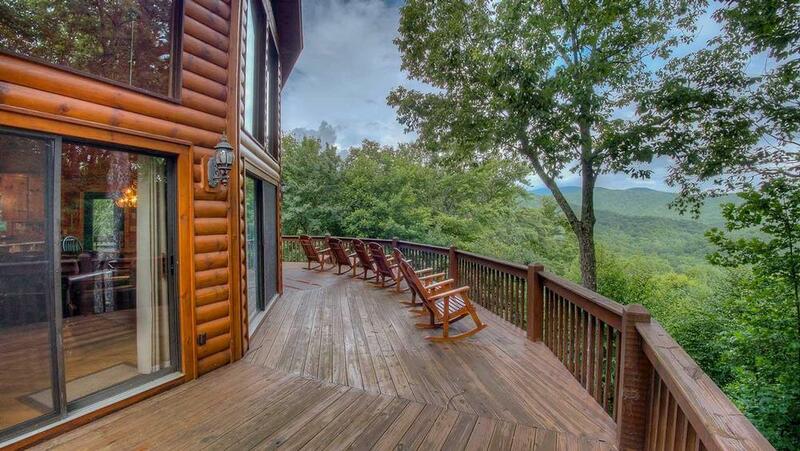 The views and weather were perfect and we chose a great cabin to be able to view such beautiful scenery. The cabin had everything we needed including bedding and kitchen stuff. The staff was amazing, they explained everything and were on top of everything for our trip. Very informative and nice. Great staff! 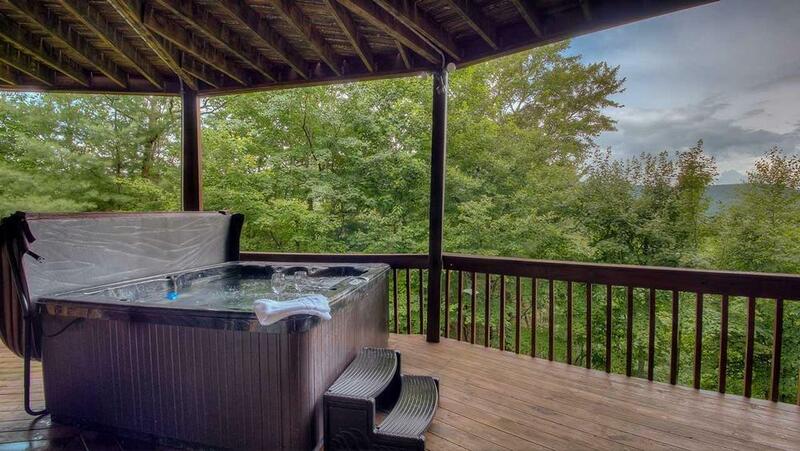 11/18 - Enjoyed the hot tub, deck, living room and game room. I've always had a good experience with this company and look forward to coming back every year. 10/18 - We loved the amazing view! As a family with toddlers in tow I appreciated the closed in porch as well as the gated deck so I didn’t have to worry too much about the twins escaping! The fireplace, hot tub and indoor jacuzzi were also amazing! 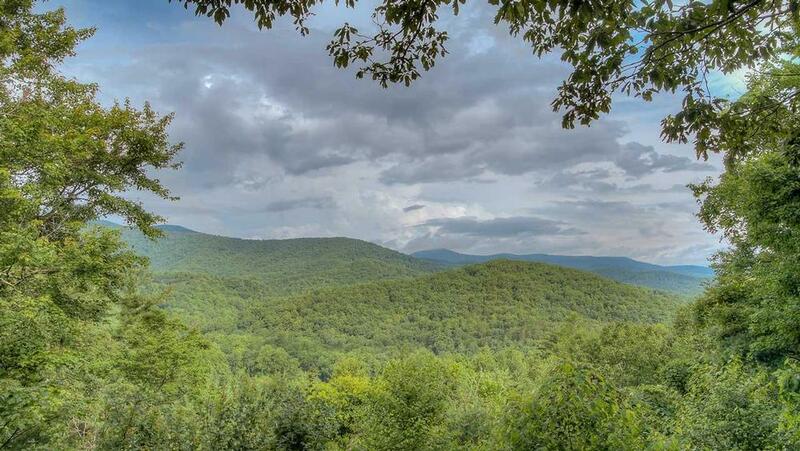 Escape to Blue Ridge made our vacation dreams come true! Very professional, quick to respond & provided a lot of extra information like activities and places to go to enjoy yourself during your stay. We love this company! 09/18 - Enjoyed the humming birds and the hot tub. Excellent company! 06/18 - The home was very clean and modern and the view was everything I had hoped it would be. The company was very easy to do business with .. no problems . 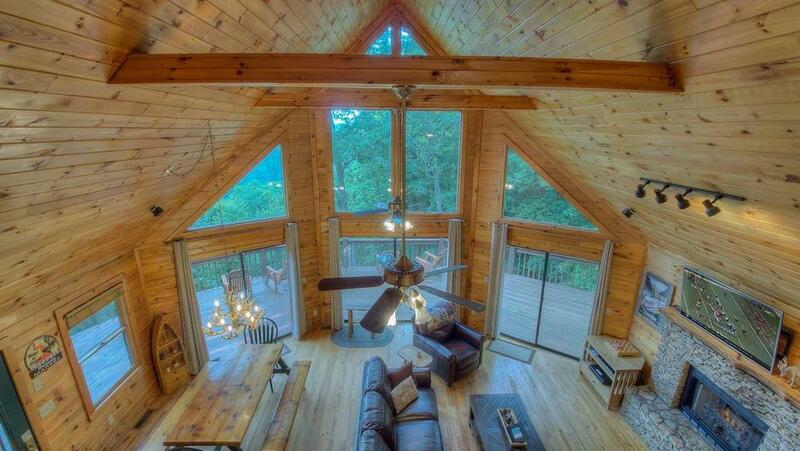 Amazing view and extremely spacious cabin. Well stocked with everything we needed to prepare meals and we all enjoyed the game room. Friendly and professional staff. Contacted us in a timely manner via email and phone with the confirmations in regards to our reservation. Our stay was terrific. Blue Horizon exceeded our expectations. 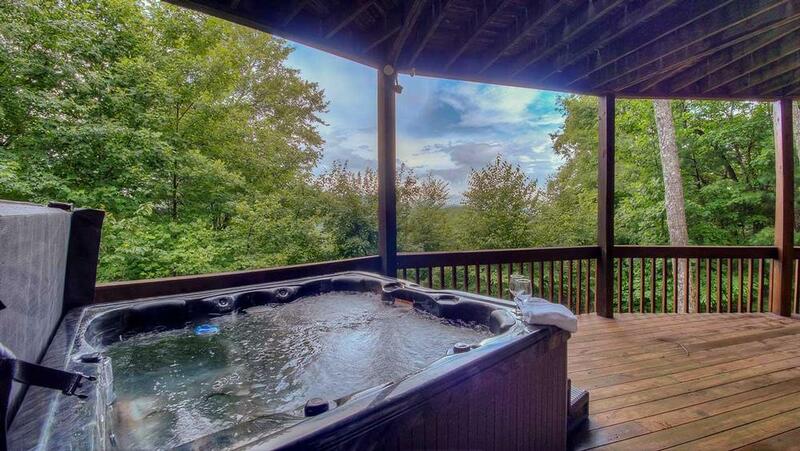 The mountain view was incredible, the hot tub and game room were a hit for the kids. Very professional, helpful, and friendly, we are looking forward to coming back next year. 3/18 - Great for dogs (locked gate for wrap around porch), beautiful views, very spacious inside, close to hiking areas. Reported issue of fridge drawer being broken and flood light not working, person I spoke with on phone was pleasant and professional. 3/18 - Loved the peacefulness and the views. The home was a great size with many activities for all. Escape to blue ridge was very easy to work with. All of our questions were answered in a quick and professional manner. 3/18 - I loved that I could bring my whole family including our fur babies (two dogs). Very professional and informative. 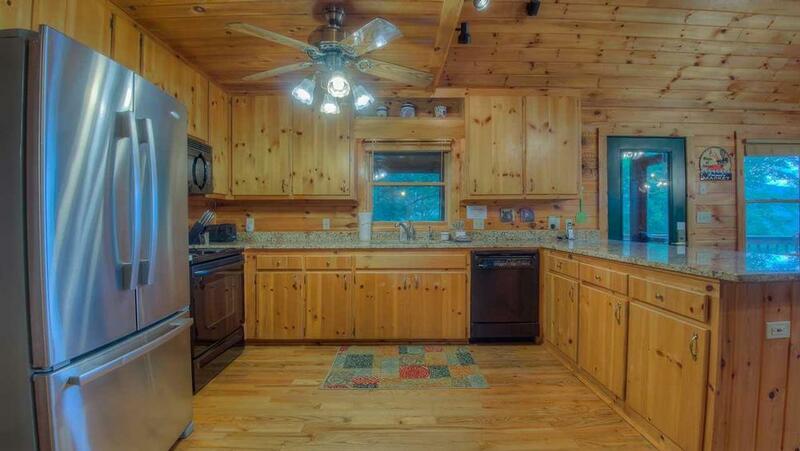 1/18 - The cabin was in a great location, furnished nicely, clean and well stocked with dishes, towels, etc. Wonderful company. 10/17- It was homey and comfortable. Perfect for the family and nice having everyone on different floors. The view was perfect! I have always had the best service every single time we deal with your company. Easy to get in touch with and very nice to talk to. You all are awesome!! 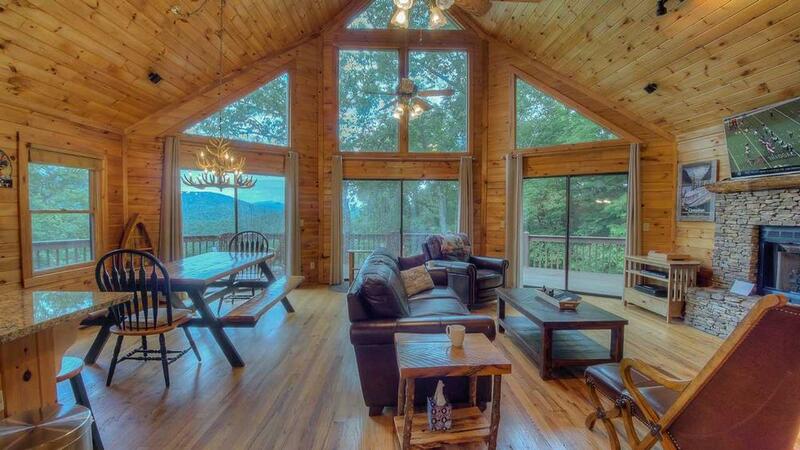 08/17- Blue Horizon is a beautiful cabin with a terrific mountain view. The beds were very comfortable and the game room downstairs was a terrific detail - the teenagers loved it. The televisions were very nice with great pictures and the den furniture was very comfy. I love Escape to Blue Ridge. Karen was super helpful and we will rent again. 07/17- View lovely. Main floor well laid out. Quiet. Everyone super helpful and quick. Appreciate your efficiency. 07/17- Private, well appointed and comfortable. Easy to work with and responsive. 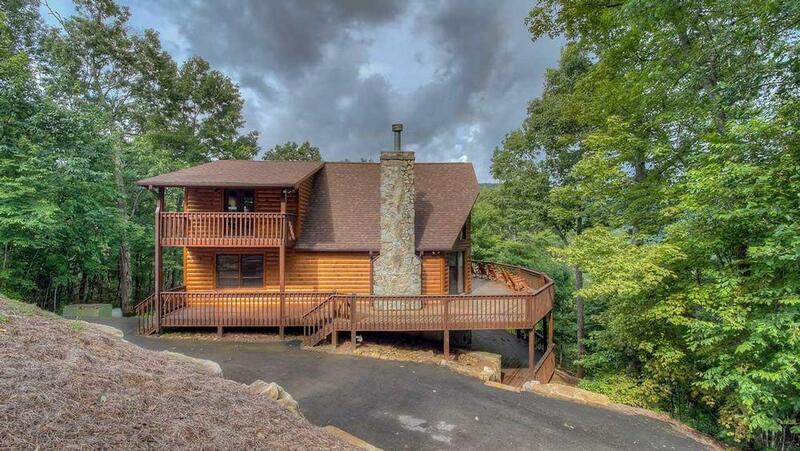 06/17- Loved the large decks and mountain views, as well as the screened in porch with tons of comfy seating and picnic table for outdoor dining. The representatives I spoke to were friendly, knowledgeable and very accommodating, also very patient with all my questions! I also appreciated the various follow up emails with directions, activity planners, etc. 03/17- There were so many activities to enjoy in the house alone, not counting the other exciting activities closer to the house. 02/17- The game room was great! 01/17- I enjoyed the scenic view, especially from the master bedroom! Very clean, loved the amenities and dishes provided. Will be back soon! 01/17- We enjoyed the location of the cabin and the view. This was a worry free vacation. The staff are very customer service oriented and friendly. 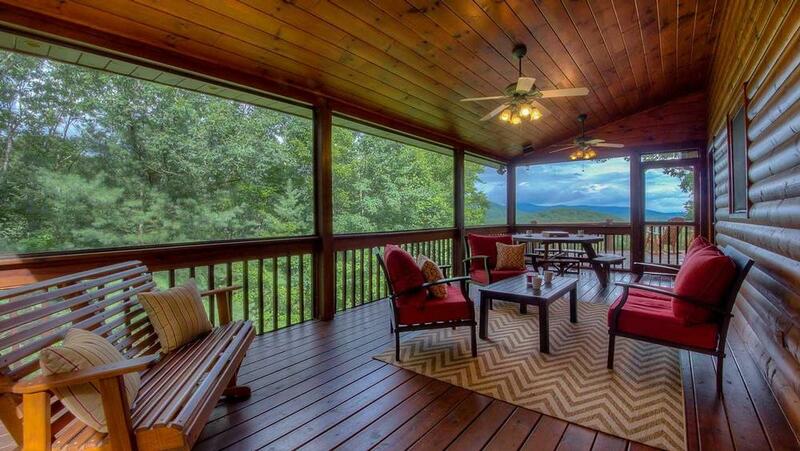 Every time I visit Blue Ridge I will stay with Escape to Blue Ridge. 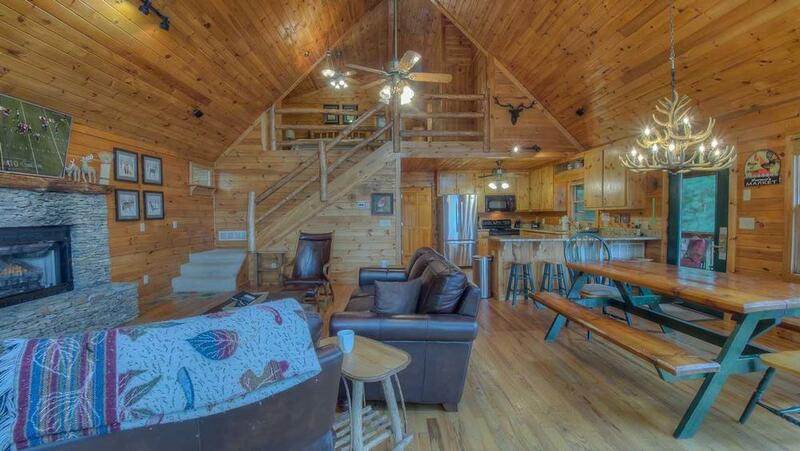 12/16- Love the wraparound deck and the way they made the cabin feel like your home away from home. Escape to Blue Ridge did a fantastic job and I received all important information in a super quick and friendly manner. Thank you. 11/16- Beautiful views! Fireplace was wonderful. 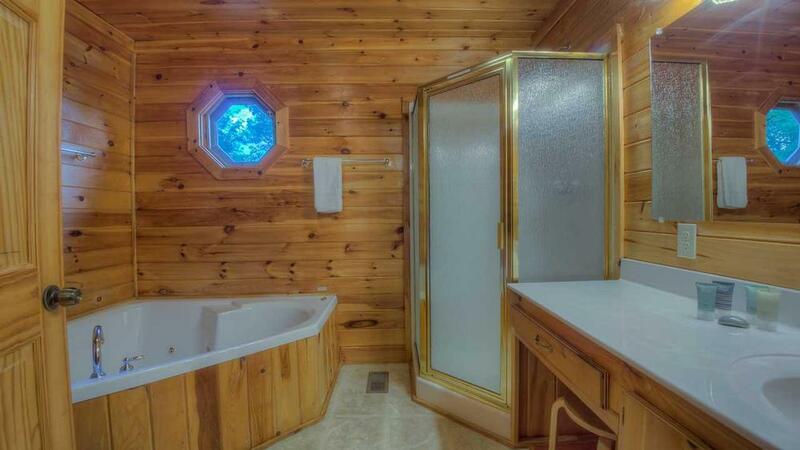 The cabin had everything you could want or need. 11/16- Beautiful view, very peaceful, private and relaxing. Every room had a view. The house was well appointed and very clean. Good supplies of pots/pans/dishes for all our home cooking. 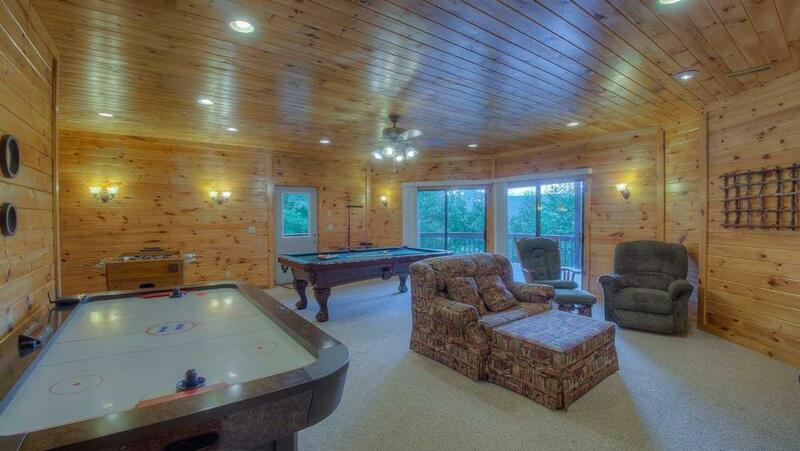 Warm and inviting all thru the house + game room was lots of fun! The reservation and concierge staff was very nice and helpful every time we talked to them throughout this process. We will definitely use Escape to Blue Ridge in the future. 11/16- The views were amazing, the house was perfect. Very, very relaxing. The reservation staff were great as I was a last minute booking and they helped us navigate thru the process. They were very helpful. 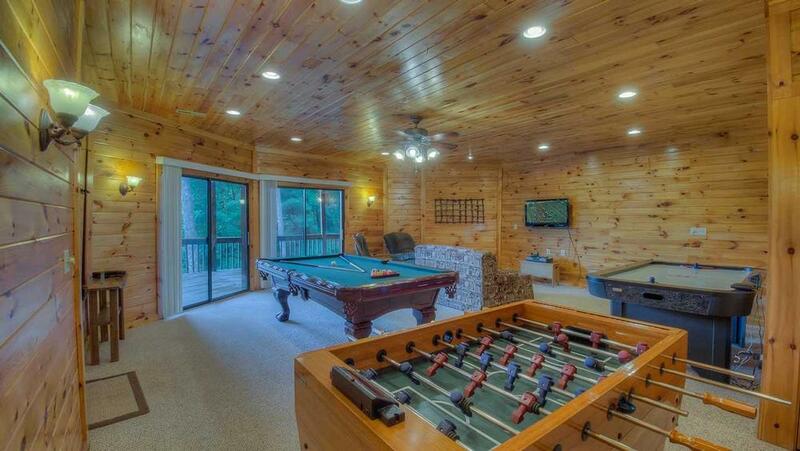 08/16- Great view, great game room for the kids. 07/16- We appreciated the peacefulness of this cabin. Since access to the community is limited by a security gate, traffic is RARE. We enjoyed walking along the nearby roads, where the hills are quite steep (which we enjoyed). 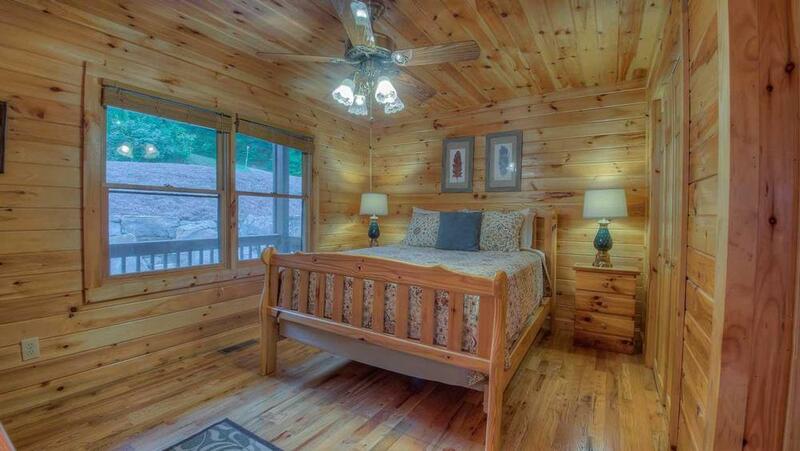 The cabin is comfortable with plenty of living space and amenities. 04/16- The cabin felt warm and relaxing. We really enjoyed the view as well as all of the adminities. 03/16- I have rented from Escape to BR 4 times now and I am again disappointed with the cabin. I love the selections you offer so I keep thinking it will get better but it doesn\'t. The kitchen was covered in mouse droppings...from pots and pans to inside the toaster. The wood all though the house is layered in dust. The house was set to 55 degrees upon our arrival and the pilot light was not light in the gas fire place. When I called I was told nobody could help yet you claim 24 hour service. 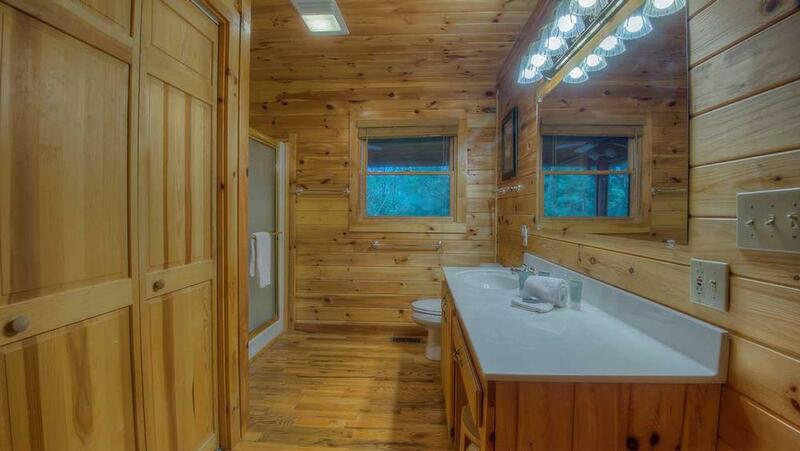 I really like the cabins you offer but when you state luxury rentals, they should be clean, heated upon arrival and staff to assist if requested. The pool table is completely uneven and the air hockey and foosball table did not have the electronic cords with them to keep scores. 02/16- Very cozy beautiful cabin, very nicely decorated. Game room was spectacular, enjoyed it very much. Jacuzzi was in a perfect spot, scenery was just perfect. 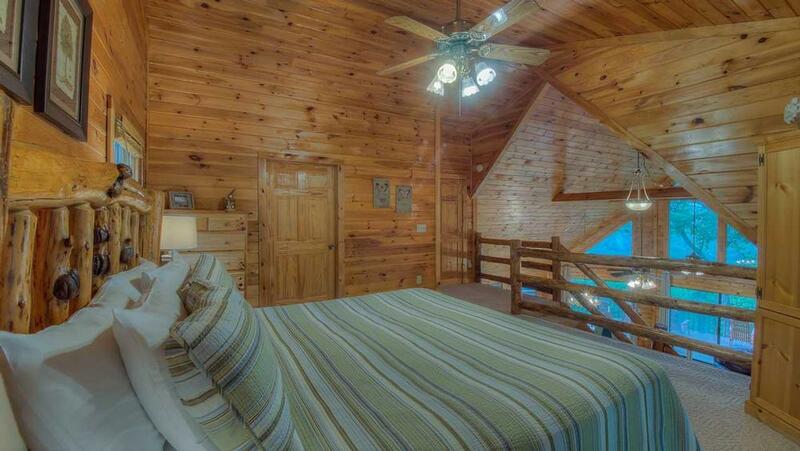 Loved the cabin "Blue Horizon"! The company was great no complaints, treated us well on the phone easy to rent the cabin, transactions were made smoothly. 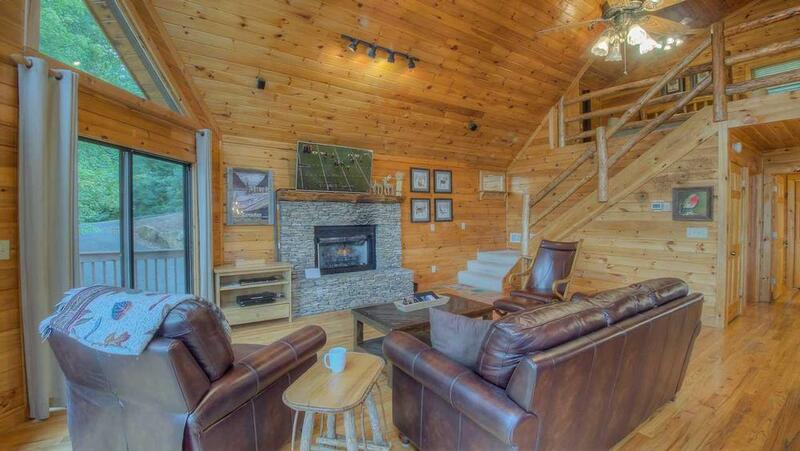 01/16- Love the layout of the cabin! The view is amazing! Great experience! We will be coming back! 01/16- The windows overlooking the mountains were perfect. . My son loved the game room. 12/15- Beautiful home, beautiful site! 11/15- It was spacious with a really pretty view. We really liked the large porches, hot tub and fire pit. 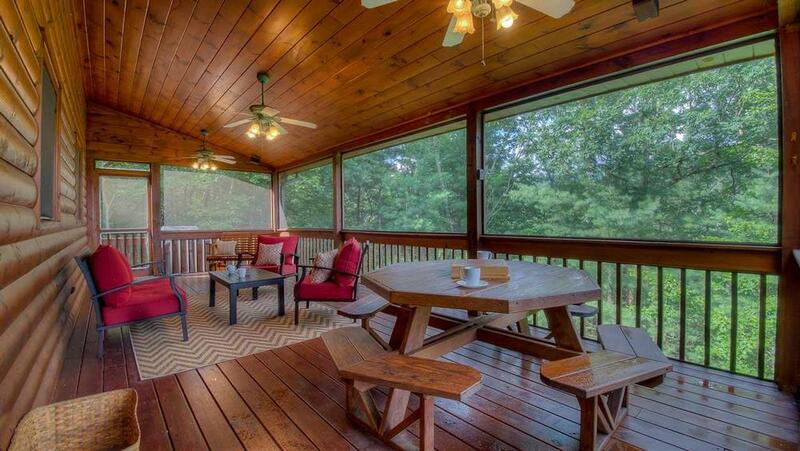 11/15- We loved the screened in porch and the option of the open deck. Of course, mostly the view! The picture did not do it justice, it was gorgeous. Also appreciated the privacy of the location. 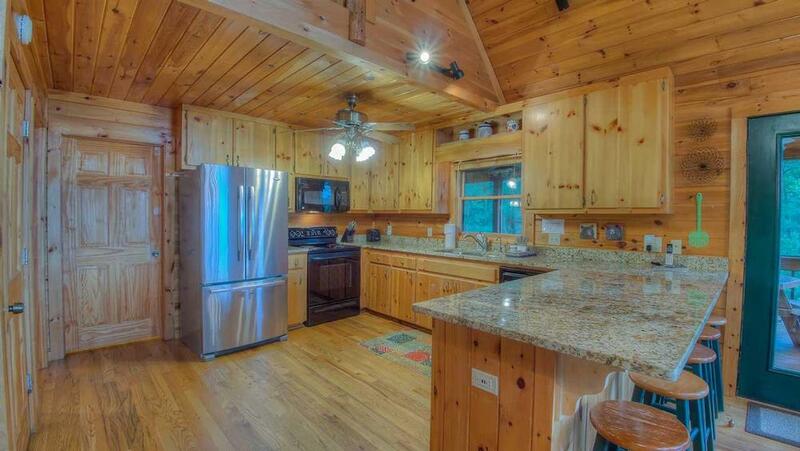 The cabin was well appointed with a good stock of kitchen items, which you don't find in many of the others. 10/15- The house we rented was fantastic and had everything we needed for a relaxing and fun vacation. Escape to Blue Ridge provided more than we expected in this house. 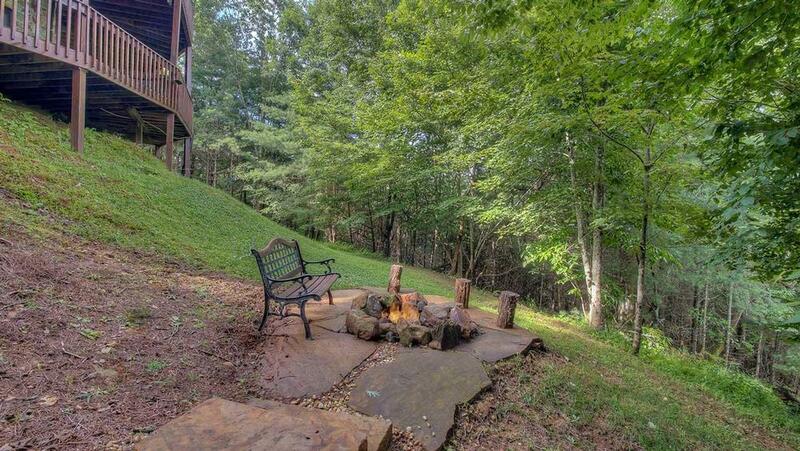 We had a great weekend and would definitely rent from them for our next mountain getaway. 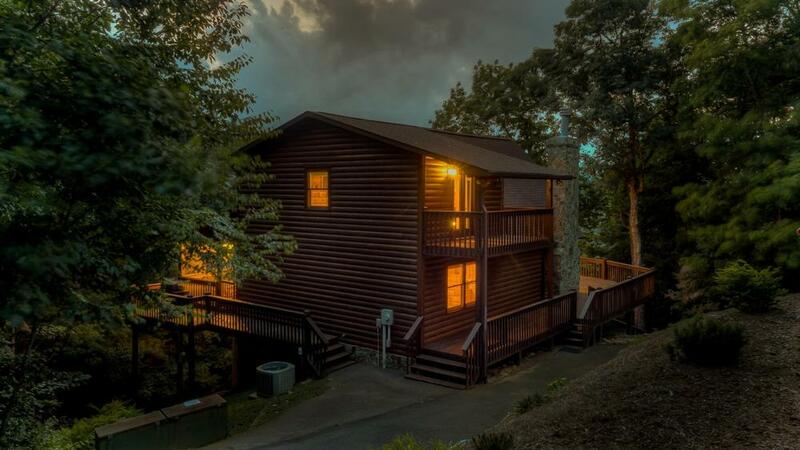 Escape to Blue Ridge is professional, friendly, and knows how to provide for great mountain vacations. 10/15- The cabin was beautiful and clean with a wonderful view. Everyone I spoke with was professional and attentive. The cabin and area was beautiful and we look forward to visiting again next year. 10/15- The coziness, cleanliness, organization and decoration. The playroom and the view from the inside was the best part.